During the holidays it's particularly difficult to be separated from loved ones who live miles away. If you're looking for the ultimate lifestyle tech gift for the grand parents or great grand parents in your life, I think we've found it. 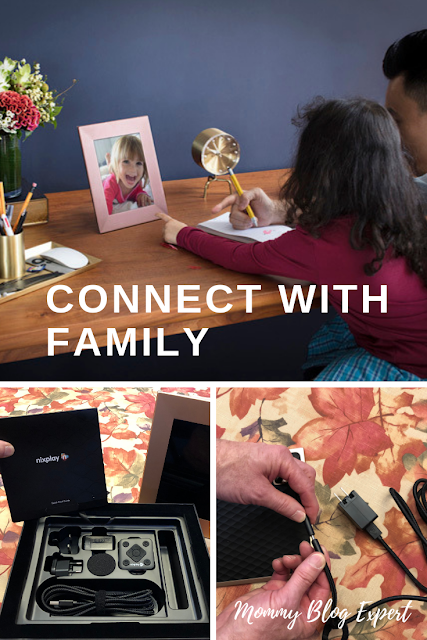 Meet Nixplay Iris, the WiFi Cloud Based Digital Frame which can bring family together virtually from all over the world not only during the holidays but year-round. Unlike digital frames with memory sticks or cards, Grandma and Grandpa don't need any technical skill or even a computer or smart phone to view and enjoy photos on their Nixplay Iris. 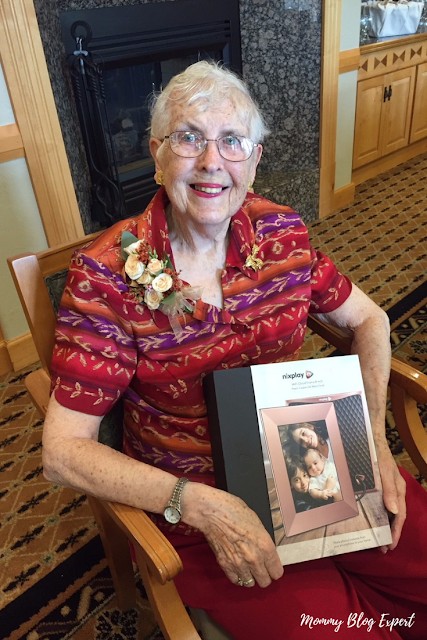 After one of the younger generation's tech savvy family members sets up the physical frame, all that's required to start enjoying the endless picture show is a power source and WiFi signal, the latter which many assisted living and independent living communities provide for their residents. Anyone who has access to the compatible cloud-based iOS or Android smartphone app who receives an email invitation from the manager of the frame can send photos to the picture display for the recipients to enjoy. It's worry-free too, since one of the best parts of Nixplay is that, once the physical frame is up and running, children or grandchildren can manage the frame from afar from their own location using the app. As my brother Forrest and his wife Tina -- grandparents of two young grandkids living out of state -- explain it, "Nixplay is like seeing a surprise whenever we walk into the room. All we have to do is glance over where the frame now stands and we get to see our grandchildren smiling and having fun. 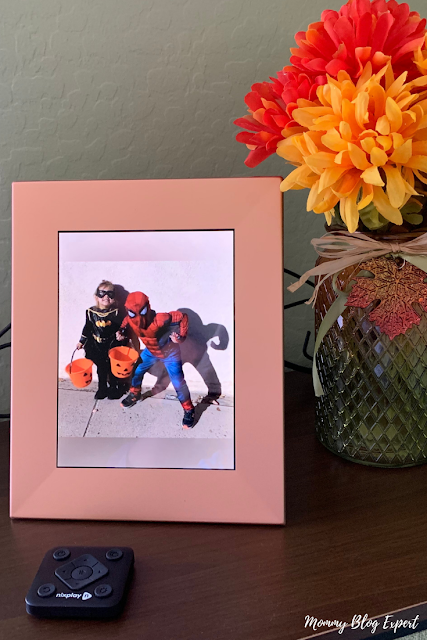 "Distance limits our visits," Tina says, "So we're glad Nixplay makes it possible for us to keep in better touch with everyday activities with all the pictures our son and wife send to our frame from their smartphones. Our other grownup sons, including one who lives abroad, have found it equally easy to send photos our way even when they hundreds or thousands of miles away. "What a surprise it was when we looked over the other day and saw an image of two of our sons with their wives (the couples like many miles apart from each other) smiling as they enjoyed a great weekend get-a-way together. It warms a parent's heart to see our adult children enjoying each other, especially when a fun descriptive caption pops up under the picture to make us laugh or smile." This item would make a great gift for grandparents, great-grandparents and especially those who are more housebound. It brings loved ones close, reminding them others care and are always thinking of them. Nixplay helps close the distance gap. 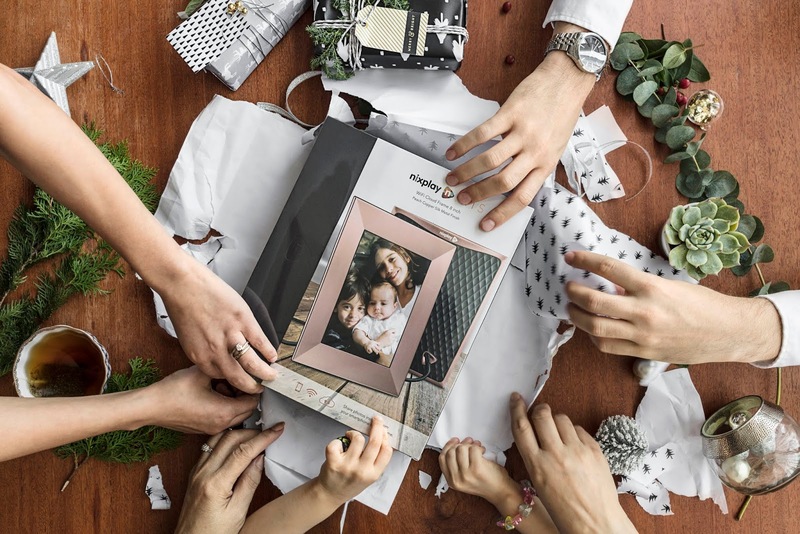 Over the holidays and special family times such as birthdays, the frame can also help the viewer feel like a more active participant in all the big celebrations and day-to-day life events of the ones they love. While your frame can be placed in a portrait or landscape position on a table top, shelf or other level indoor surface, there are many control functions including the light sensor, transition type, transition time, volume, clock, the sleep schedule and even an activity sensor setting that can enhance the viewing experience. There are multiple albums available in your Nixplay cloud account, too, making it easy to go into your account and save added pictures to photo collections as well as organize and delete photos. Another plus: the frame is capable of connecting to all social platforms to deliver more images. Choosing the settings button on your remote allows the user to navigate through and easily select multiple transitions, transition time, volume, captions, updates and much more. The Nixplay app can be downloaded and then used to send pictures directly from chosen devices. Loved ones you invite through email will be able to easily set up their own account and send photos directly to the picture frame. To maximize enjoyment of this innovative product be sure to place the frame in a location easily visible to the user. The Nixplay Iris is a great reminder that family is as close as this cloud-based frame, even when kids, grandkids and other loved ones are actually miles away. The Nixplay Iris WiFi Cloud 8" Frame, $199.00, arrives beautifully packaged, ready for gift giving. Equipped with a motion sensor, the frame plays photos in 4:3 High Resolution IPS Display. In addition to the Peach Copper Silk Metal Finish Frame we received for this review, this Nixplay model also comes in several other finishes including Silver and Burnished Bronze to suit a variety of home decorating styles and living situations. The bendable power cable is flexible, providing a stand for frame orientation. Learn more and buy at Nixplay.com. You can also stay in the loop with everything the brand is doing on Facebook, Twitter, and Instagram. Surprise someone special with the Nixplay Iris WiFi Cloud Frame. Fun surprises await when you instantly see new photos added to your screen from friends or family! *This special 25% off offer is available for a limited time only at Nixplay.com from November 19, 2018 to November 30, 2018 at 11:30 pm PST/2:30 am EST. Must use code MBE25 at checkout to receive discount. This sounds like a really awesome idea! I love being able to get 25% off right now. Thanks for the heads up on this! Love this idea. My parents have internet but my Dad won't email or do much on it so what a great gift... seeing photos just sent magically! This is a really cool idea for a family holiday gift. I'll have to try to take advantage of the deal! This is a sweet way to stay connected with loved ones. Great savings too! What a lovely gift idea for someone who is not around. My sister lives across the country and would love something like this. Love the idea! Can't wait to share! Such a great Holiday gift! I'm planning on giving a few of these for Christmas this year! They make such great gifts! I even have one for myself! I'd love to have one of these! I have an older frame similar to this but I have to add new photos to it. I've been meaning to do it for months! This is a brilliant idea! Love this idea! What a great way to send pictures to Grandpa and Grandma when they are not techie at all! I love it! This sounds really awesome! Such a great way to enjoy with the whole family! This would be a great gift for my parents!!! I need to look into this!